I’ve been teaching a long time. A quarter of a century (!) seems to have passed in no time. Some classes have been great, some not so great. But October in Texas is such a glorious time of year that I knew these classes would be special. The drive in from Denver is always a grueling drive when I leave at 4 AM, and drive down Hwy 287, through all those Texas towns. And to make matters worse, this was Texas-OU week-end, plus the opening of the Texas State Fair, the week-end for the big Cottonwood Art Festival, and the Intergem show, plus a Rangers game. So no wonder I spent 30 minutes driving around in the new Cowboy Stadium parking lot, which was packed with overflow cars. I could see the Sheraton, I just couldn’t drive to it! But the days of packing, planning, making copies, ordering tools, supplies, etc were through, and I was so pleased I remembered everything. I was feeling quite good, thank you very much. I met my dear friend Jane from Fairplay, who now lives back home in Pauls Valley, OK. She was my “roadie”. We had some dinner Friday night and got to bed early, I was prepared for a good day of classes, and Jane planned a day of lounging by the pool. At 4 AM I sat straight up in bed. OMG! I had forgotten the strikers for the torches! Where would I get strikers at 8:30 in the morning for class? Oh, man! How could I be such an idiot! So I gnashed my teeth over that for a while, until I got to Beadfest, and I should have known, my sister Texans would come to my rescue. (The phrase, “Don’t Mess With Texas Women” comes to mind.) Wild Beads has become my favorite bead store in the world! They had a booth at the vendor section of Beadfest,. They must have seen the panic in my eyes, and they asked the owner, Beverly, bring me three strikers. They let me use their workshop strikers. Thank you so much. You saved me from tool disgrace! I knew from the moment people started arriving, it would be a good class. We were in a tiny room, all 20 of us, ready to learn sawing, filing, and soldering. The seed beaders had huge rooms. But we made it work. (They’ve promised me a larger room next year.) I had the joy of re-acquainting myself with Joanie, one of my favorite students from Big D who took my class in Santa Fe. 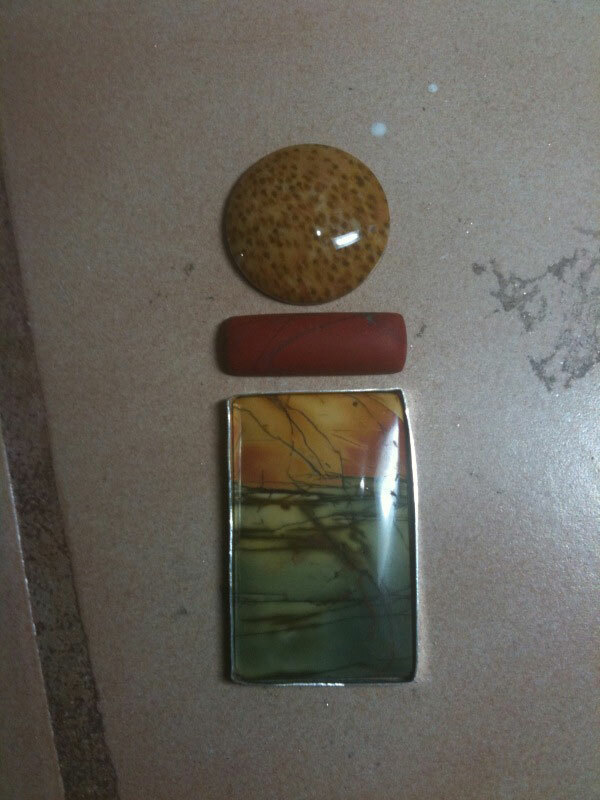 We later had dinner at Papadeaux’s (yum) and we will meet again for Santa Fe Beadfest on my birthday in March. This was a great class, they laughed at my jokes and I got to laugh at Bruce and Kathryn’s “matching luggage”–all their tools, like mine, were packed in the same matching green plastic boxes. What exquisite taste we have. The day went fine, and I enjoyed teaching people who don’t make fun of my Texas accent–which got a bit broader as the day progressed. The students made my signature triangle earrings. Because I use no electricity when making jewelry, I introduced them to a tool that has been around for centuries, the old bow drill. The Egyptians built the pyramids using a drill very much like this, and it’s what we use when I’m teaching in South America. 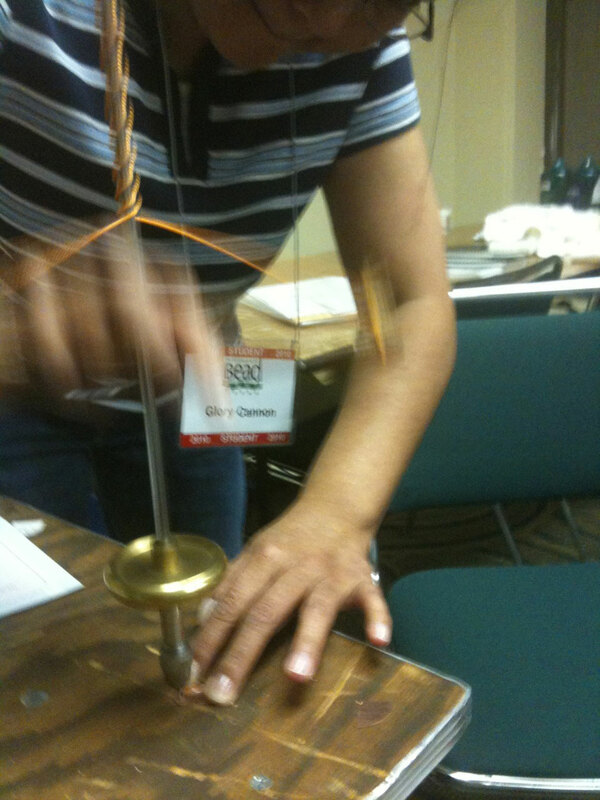 It’s a bit tricky, and the drill bit broke a few times, but those who got the centrifugal force going really enjoyed it. During the afternoon we got into “The Joy of Soldering”, and everyone made 3 stacking rings and saw how easy my soldering technique is to learn. I loved getting the hugs as we parted and want to keep in touch with all of you. I want to say a special hello to Janna from Thrall. Your smile lights up a room! 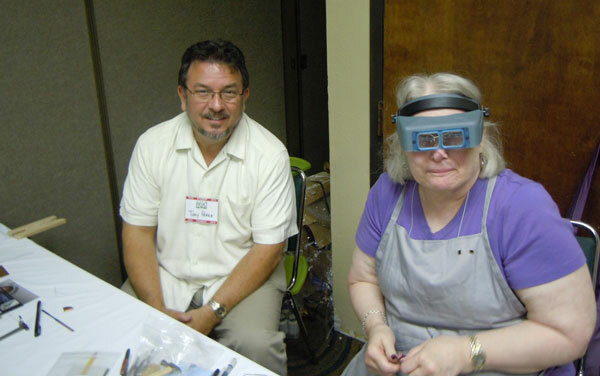 I was most impressed with Tony, (pictured) who took the class because his wife was taking another class at the same time, but wanted to learn soldering techniques, so mucho kudos to Tony! You certainly deserve the Golden Torch Award. And to Kathryn (pictured with Tony) and Bruce, you were so much fun. And I can’t forget a big “Thank you” to Tom who gave me some great flush cutters. They are very appreciated. After dinner with Joanie, Jane and I went to sleep tired, but happy. Sunday was another great day. I snuck away during the lunch break to buy some Gary B. Wilson stones from Gary’s daughter Jesse and future son in law, Spencer. I got some great shapes in petrified turtle shell, which I’ll pair with fossil palm and red jasper, and maybe dino doodoo. In this class I met more wonderful women, especially Jude and Monette, who we later shared Sunday breakfast with. J, you are my inspiration. And Glory, no one works that Egyptian drill better than you. Laura, I love being your friend on Facebook! Thanks for “Friending” me. And a special thanks to Patty for dinner at Gloria’s. What a cool place! And mostly, Jane, I can’t thank you enough. I couldn’t have gotten everything moved without your help. And thanks for making me stop now and then and laugh. I love you! 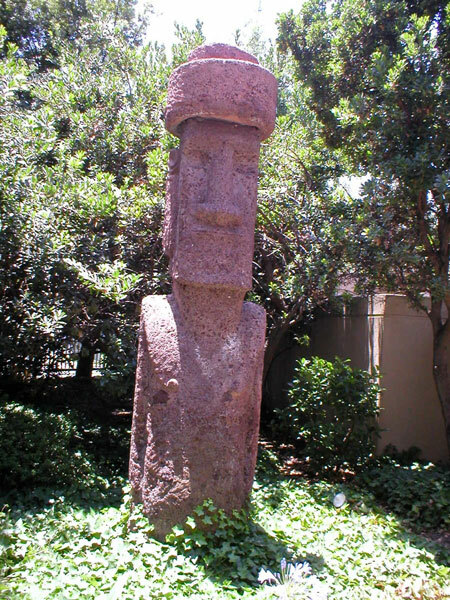 Then it was off to Easter Island, (called Isla de Pascua or in the native tongue, Rapa Nui.) The Navel of the World is indeed a long, long way away. Though I was hoping to find some nice beads, I did purchase some unique shell necklaces, the kind worn by the islanders for the last 400 years. I will hang those with my personal beads, those I can’t part with from the 4 corners of the world. Rapa Nui is amazing, and the moai are haunting. On the way back from Chile, it was announced that the drill had broken through to free the Chilean miners. God bless those brave men and their families. My husband is a metallurgical engineer, and I understand their plight so well. 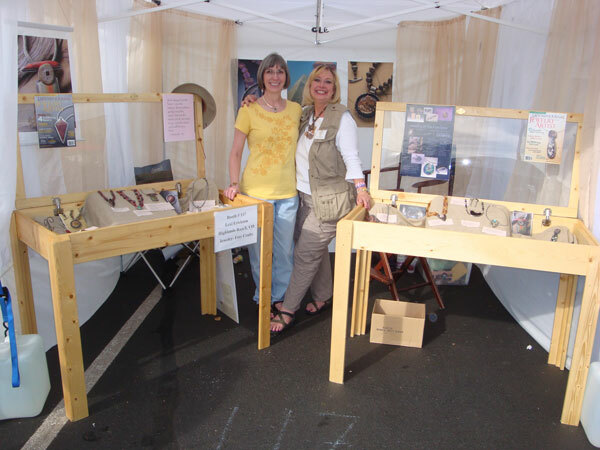 Upon landing, its rush-rush now to get ready for the Denver Botanic Gardens, Jewelry Show. 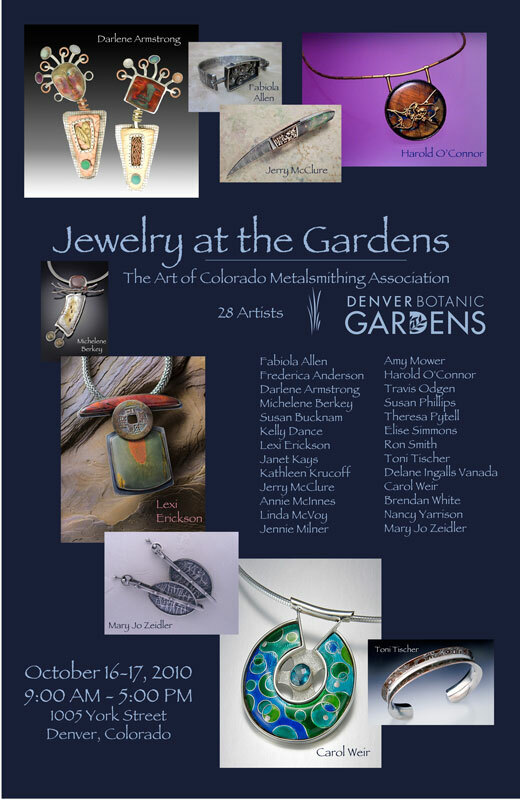 Twenty eight of us will be showing our jewelry. Our artists, including the famed Harold O’Connor, are all very talented and every one is totally different. 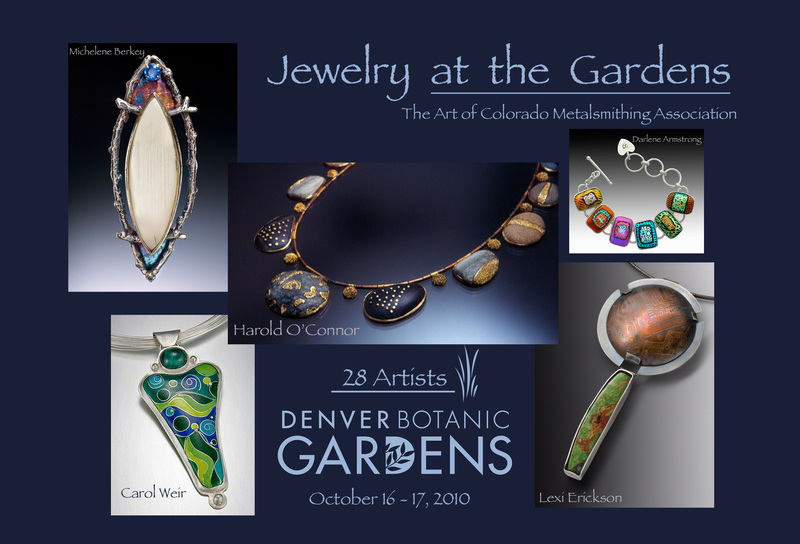 Please join us this coming Saturday and Sunday at the Denver Botanic Gardens, from 9-5. You will be amazed at the talent in Colorado. Thank you everyone in Texas for two of the most wonderful classes I’ve ever had, and I will always remember your eagerness and enthusiasm (and matching “luggage”) and keep these memories in my heart. It was good to be back home in Texas for a few days.. Please keep in touch, as each and every one of you is forever my friend. Email me!